Who would have ever thought that 2012 would hold so many exciting things for C'est Moi! We are receiving new shipments daily as well as holding a variety of workshops,hitting the road to be a vendor at Vintage Marketplace, and the most exciting news... Annie Sloan herself will be coming to Nashville! We are so excited to be on the map this year with Vintage Marketplace. 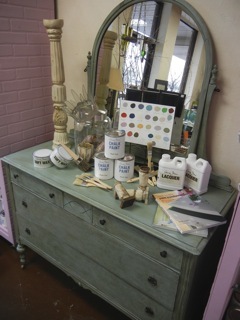 What kind of vintage enthusiast show would be complete without Annie Sloan Chalk Paint? We will be holding daily demos. Don't get too carried away with excitement, you'll forget to sign up for a chance to win a ticket to the Annie Sloan North American Tour workshop. Be sure to join us February 2nd- 4th at the Hendersonville Expo Center to get your fill on junk'N it up! As you all may know, I went to Oxford, England last summer to train with Annie. I was so excited to see that she had posted this video so that I could share her fabulous shop with all of you. You will absolutely love it! Take note of how her personality really shows when she is painting...right down to her twinkly little toes. Want to Meet the fantastic Annie? Sign up for her stop in Nashville on the North American Annie Sloan Tour and join her for a full day, hands on workshop, where you can play in paint with the master herself. The workshop will be held Monday March 26th, at the Franklin Marriott in Cool Springs. Go to www.anniesloanunfolded.com to register.